The Renaissance Wench: New Project Supplies!! This is the new fabric for an upcoming project that I think is super cute. The stripe is Michael Miller and the horses are some imported something something by Kokka--a Japanese fabric. 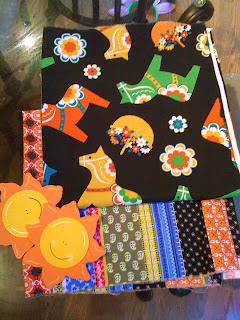 I have never heard of them, but the fabric lady was all enamored with them and Cariboo (Baby Girl) picked it out. They arent really meant to go together, but i think they do so they will!! If Chris does his part and gets my project started this weekend, I will post more pics later. It is going to be soooo cute. So is this somehow related to the kitchen? I still don't see how Chris is related to this fabric?